For someone as talented as von Schirach, a man seemingly well aware of the follies of dubstep, it's a shame that the kaliedoscopic first half of Supermeng gives way to flat, wobble-bass heavy experimentation as the album concludes. 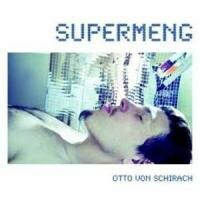 In the first 15 minutes of Supermeng, Otto von Schirach blitzkriegs his way through many different genres. Opener and lead single "Salpica (Miami)" variates on the general mood of Yello's classic hit "Oh Yeah" (or, as some know it, "Day Bow Bow"). "Ultimate Universe" blends together Van Halen-esque guitar runs with '80s dance music. "The Blob" is dubstep to the nth extreme. "Breathe the Beat" is a dance craze in the waits, featuring glammed up synths that would be likely candidates to be sampled on a future Kanye West-related project. All of this happens not even halfway into the album. This scattershot-style experimentation would ordinarily lend itself to a jarring listening experience, as if being slapped in the face by a wad of shotgun pellets. In many ways, this is one of the big follies of Supermeng: There's way too much going on, and even though von Schirach's ebullience keeps the record from becoming an amorphous glob of disparate sounds, the speed at which he moves makes all this more challenging than it needs to be. Fortunately, there's at least von Schirach's eccentricities as the common thread to unite these song-to-song transition shocks. The nonsensical video for "Salpica (Miami)", which for my money rivals the equally ridiculous one for PSY's atrocious transcontinental pop hit "Gangnam Style", reveals him to be an artist who knows the many sub-genres in electronic music to the point that he can inflect them with his brand of weirdness. Case in point: the aforementioned dubstep track "The Blob". I didn't think it would be possible to onomatopoetically title a song after the hyper-prevalent wobble bass, but von Schirach nails it here. The main riff is an exaggerated use of the wobble bass, almost to the point of self-parody. My first listening of the song gave me the impression that it was satirical; the increased prevalence of dubstep a la Skrillex is no doubt the bane of edgier, more experimental musicians like von Schirach (as well as DJs worldwide), and the overusage of the bass on "The Blob" would suggest that his tongue is firmly in cheek. Taken by itself, "The Blob" is a a pretty great cut; unfortunately, when placed in the context of Supermeng, making a case for it as dubstep satire becomes more difficult. For while von Schirach's genre-hopping makes a strong impression in the first half, the final stretch of the record focuses too much on bass-heavy stylistics, so much so that von Schirach no longer appears as intelligent critic of popular dubstep but instead its victim. Even the humorous samples and the cool Ajapai bass of "When Dinosaurs Rule the Earth" sags under the weight of tropes von Schirach should have been keener to avoid. The impression left by Supermeng is that, despite how outright bizarre of an album it is, in many ways von Schirach has yet to let all of his crazy out. Any time he gets close to genius —like on "The Blob"— he reneges on any potential at cutting-edge by going for all of the safe choices. He's still skillful at straightforward tracks: The best dance track of last year, Modeselektor's "Evil Twin", featured von Schirach on vocals, and while the 4/4 simplicity of that track isn’t replicated here, tracks like “Breathe the Beat” successfully use only a few ingredients to make a killer jam. Supermeng thus presents two versions of von Schirach: the guy you’d totally want spinning tables at your next house party and the witty songwriter with an eye for electronic music’s many absurdities that has yet to actualize his talents. This means that while Supermeng is a fun and recommendable LP, it’s also a maddeningly uneven depiction of a skilled musician’s talent.